Now that Halloween and Thanksgiving have come and gone, it’s officially gift-giving season! Let’s welcome the chaos of crowded department stores, delays in shipping, and the ever-too-often “I have no idea what to buy anyone on my list” concerns. This holiday season, Pinterest has answered this cry of desperation. According to an article on Marketing Land, the social network has partnered with big brands like Kohl’s, Macy’s, and Lowe’s to help users find gifts their loved ones will rave about. 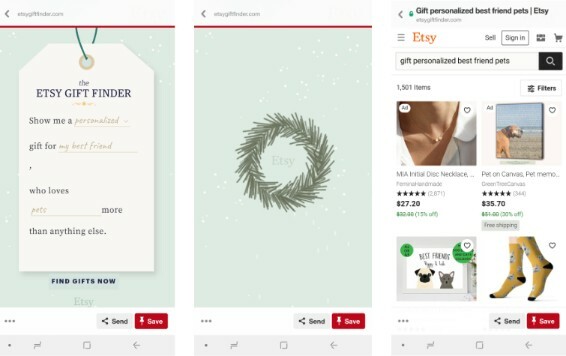 What’s more, Pinterest and Etsy have also teamed up to bring personalized shopping to the next level and give marketers something to envy. Let’s take a closer look at these two unique, interactive offers and what makes them special. 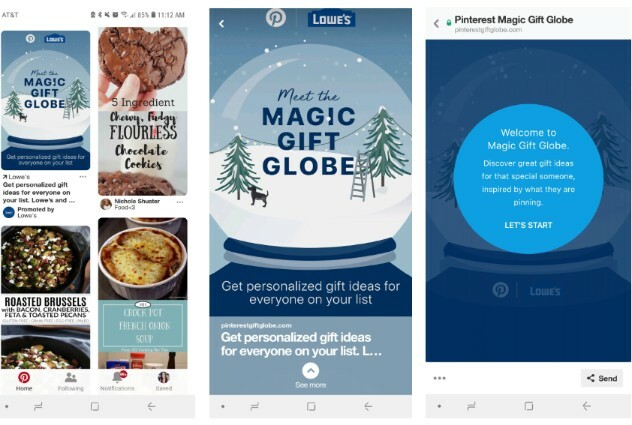 In this offer, Kohl’s, Macy’s, and Lowe’s have all partnered with Pinterest to create their own digital gift snowglobes. 1. While scrolling through your Pinterest feed, you’ll encounter the promoted Gift Globe pins. I happened to stumble upon Lowe’s first. When I clicked on the pin, it brought up the Magic Gift Globe, and while scrolling, it prompted me to get started. 2. You’re then asked to type in who you’re shopping for. It seems the person needs to have a Pinterest account for these tools by default, so make sure you find their profile in the drop-down. However, if the person you’re shopping for is not on Pinterest, there’s a helpful option for that, as well. Once you’ve entered the name of the person you’re shopping for, the Gift Globe will list some ideas that they may be interested in based on what they’ve pinned in the past. You can then click on a category to remove it if you don’t think it belongs, or you can add additional categories. 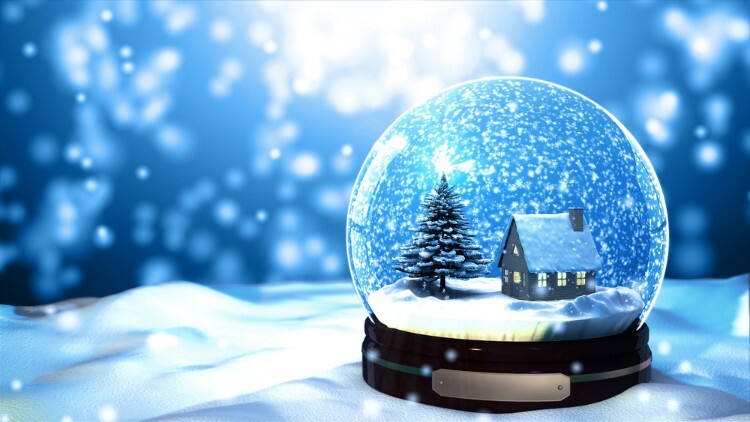 The best part, though, is what comes next -- you’re prompted to actually shake your phone like you would shake a real snow globe! 3. 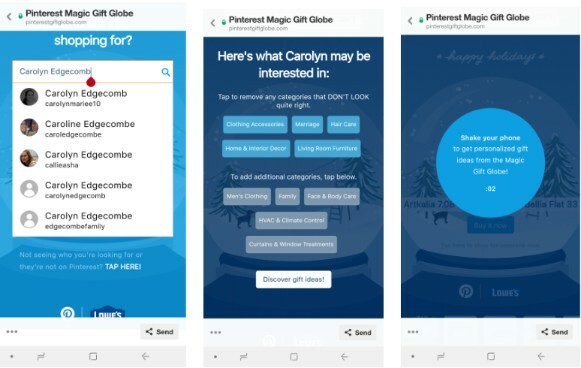 After you’ve shaken your phone, the Gift Globe comes up with a personalized gift suggestion, and you’re encouraged to “Buy It Now” right from the app. In an effort to promote the globes, each of the three brands is using Pinterest Promoted Videos at maximum width or Promoted Pins to drive more users to their customized platform. Similar to the Gift Globes, The Etsy Gift Finder helps you discover the perfect holiday gift for each person on your list using personalization. 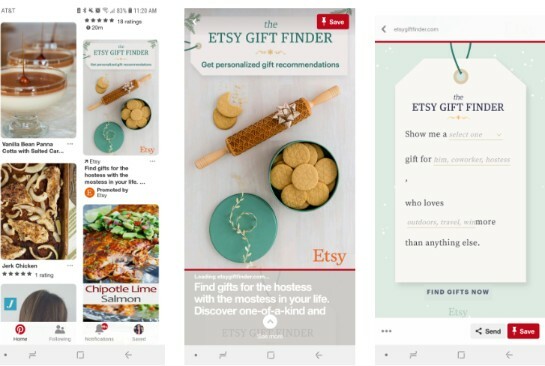 Etsy is also promoting this tool using maximum-width Promoted Videos and Promoted Pins within the Pinterest platform like its globe counterparts. When clicking the pin and scrolling down in the tool, a gift tag will appear. 2. Once there, you can then enter information in the appropriate spaces, including the type of gift, the person you’re shopping for, and what their interests are. Click “Find Gifts Now,” and Etsy will curate a page of items straight from their online shop. With the holiday season now upon us, it’s vital that you start -- if you haven’t already -- thinking about compelling campaigns to promote your brand. Everyone is vying for the consumer’s attention this season, so whatever you do needs to stand out. It’s important to note that buyers are more in-tune than ever with personalized shopping and experiences. In fact, OptinMonster mentions that Gartner predicts that eCommerce businesses that personalize successfully could see profits rise by 15% by 2020. As a result, Pinterest states that in order to stand out from the competition, companies should shift their focus to provide better shopping experiences, not just better deals, with more personalized experiences. What’s more, mobile commerce (or m-commerce) is expected to account for 44% of total holiday eCommerce spending this year, so make sure your mobile shopping experience is fully optimized. Ensure your ads are mobile-friendly, so you can reach your audience on any device. Visuals help people find what they’re looking for much faster, so leverage graphics where it’s appropriate. Make it easy for someone to get to where they want to be; avoid fluff, and keep the end goal in mind. Use personalization tactics that make sense for your business. Some examples include using geo-location targeting, showing product recommendations based on previous actions or browsing behavior, and like Pinterest and other big brands are doing, personalizing search results. Remember, personalization doesn’t have to be used just for holiday campaigns. Depending on your audience’s website behavior, try implementing strategies that include smart content to better target your visitors and create more effective and defined journeys.